Last month, Disney and Marvel Studios just announced that Avengers: Infinity War will be coming out on April 27th, 2018. This excited fans because the release date was pushed one week earlier than previously anticipated. But – it’s just one week. How big of a deal can that be? Turns out, a pretty darn big deal. Now, Avengers will be opening around the same timeframe as Dwayne Johnson’s new film Rampage and Amy Schumer‘s I Feel Pretty. After its 2015 Star War’s baby The Force Awakens lost No. 1 title in terms of box office revenue to Fate of the Furious, a franchise under Universal Studios, Disney is back and ready for revenge: Forbes states that the studio is striving to make Avengers score the world record for global opening weekend – the film planned to release the film worldwide on the same date as its US release (but two days ago it’s been announced that the film will open in China on May 11 so that’s a little awkward). Of course, this date shift to April 27th also gives some much wanted space for other Disney/Marvel movies to flourish a bit more: Deadpool 2 will be opening May 18th, and Solo on May 25th. Check out Cinema 35’s announcement of the second tailer for Avengers Infinity War. 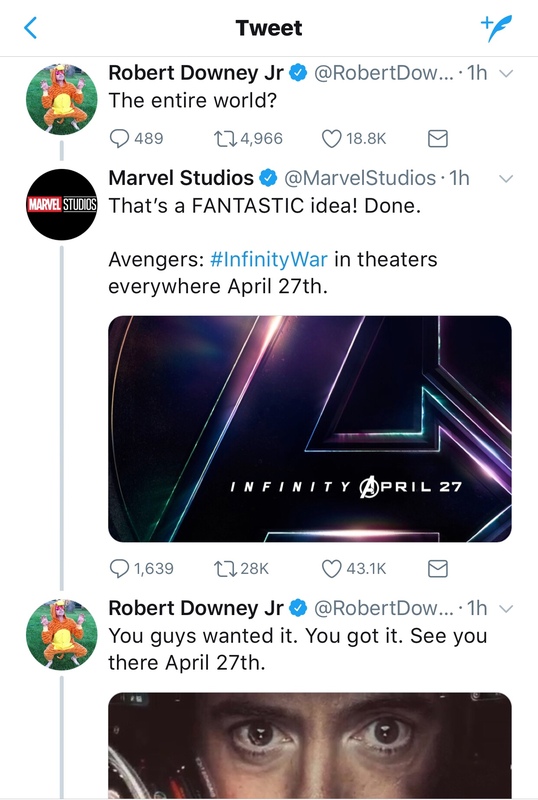 Tags: Avengers: Infinity War Robert Downey Jr.